Help! I screwed up again with backing!!! Thread: Help! I screwed up again with backing!!! I always make a mistake when I measure, cut and piece my backing fabric, and end up having to tack on pieces often both for width and length. How do you figure the best way to lay the fabric out (lengthwise or widthwise) and then how to cut? There must be a better way! 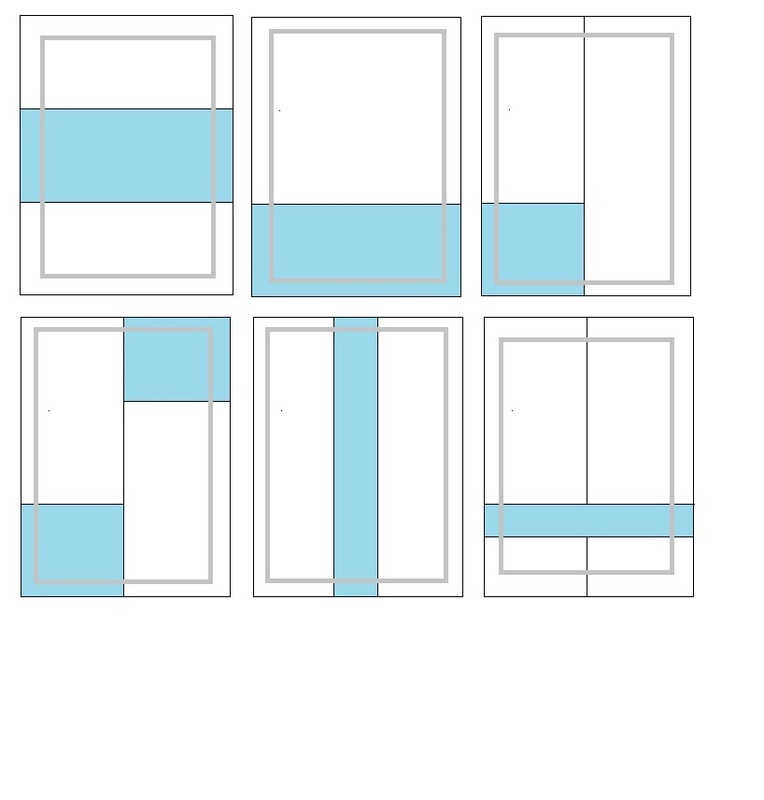 Here are some graphics of ways I extend the width/length of 45" wide fabric when i'm doing backings. I always allow enough fabric to match the top, then add at least 4-8" more (depends on how big it will finish) to that size to allow for "take up" during the quilting. The inner gray lines represent the pieced top the pieced top. The outer lines are the edges of the pieced backing. I usually lay my finished quilt top on top of my backing fabric to measure the length. I put a pin in where my quilt top ends and bring it to my cutting table. I re- fold the backing fabric and I measure 6 inches past my pin and cut across the fabric. If I need it wider than 1 length of the fabric, I use the already cut piece of backing to cut more backing. The extra 6 inches gives me approx. 3 extra inches fudge room on both ends of the top in case it stretches or the quilting takes up more fabric. 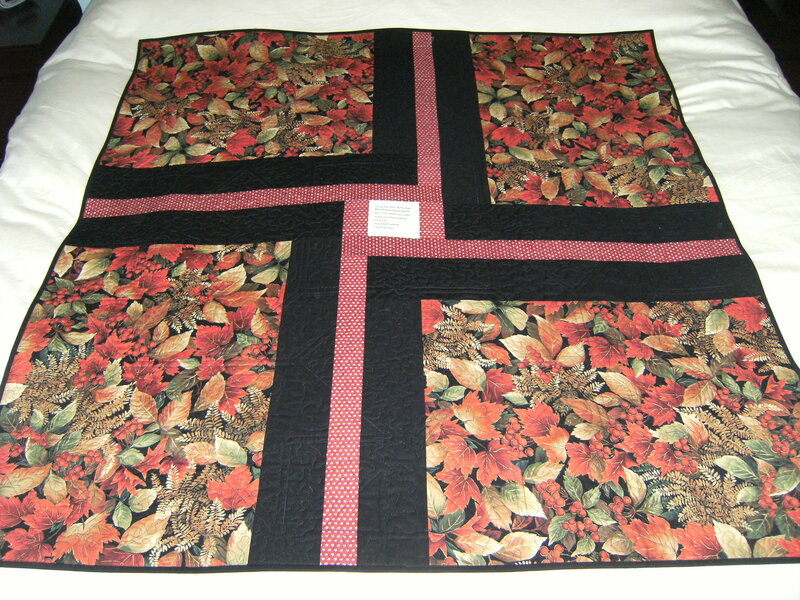 When my quilt is quilted, I square up my edges and the extra fudge fabric goes in my scrap bin. Jan, I always really appreciate the graphics you include!!! Thanks. I don't take an actual measurement. I lay the top out on the floor. I lay the backing fabric on top and if I'm going lengthwise I give it a good four inches on one end and another four inches on the other end. Then snip and rip. Then I can fold the rest of my backing fabric to get however many lengths I need. Here lately I've been putting the seams side to side since that's the way most longarm quilters prefer the seams. I do the same thing basically though, lay out the top, lay the backing over the top giving it a good four inches above the top of the quilt, snip, rip and then measure off the rest of the pieces that I need making sure the total length is a good 8 inches longer than the top. I make diagrams and figure mathematically whether lengthwise or crosswise will work best. or another solution is purchase wide backing- there are a number of sites that sell backing fabrics in 90", 108" and 110-120" wide- it is cost effective- you only need 3 yards (108") for a queen sized quilt- often winds up being much less expensive and much easier- no piecing! fabric.com has a really large selection; backside quilting; many shops= just do a search...my local shop carries about a dozen, and joannes carries a number also. I order many of mine from fabric.com since they have free shipping at the $35 mark. instead of 9 yards of fabric @ $9 a yard,($81) you can buy 3 yards of backing fabric for $12-$14 a yard ($36-$42) and back a big quilt! there are lots of prints and batiks available in wide fabrics. Me too. Recently, I've started using a little back art - or at least I try to use up some of the left-over blocks and assorted fabrics from the projects to supplement the planned backing fabric. Then it doesn't look like I messed up should I miscalculate and have to add more. 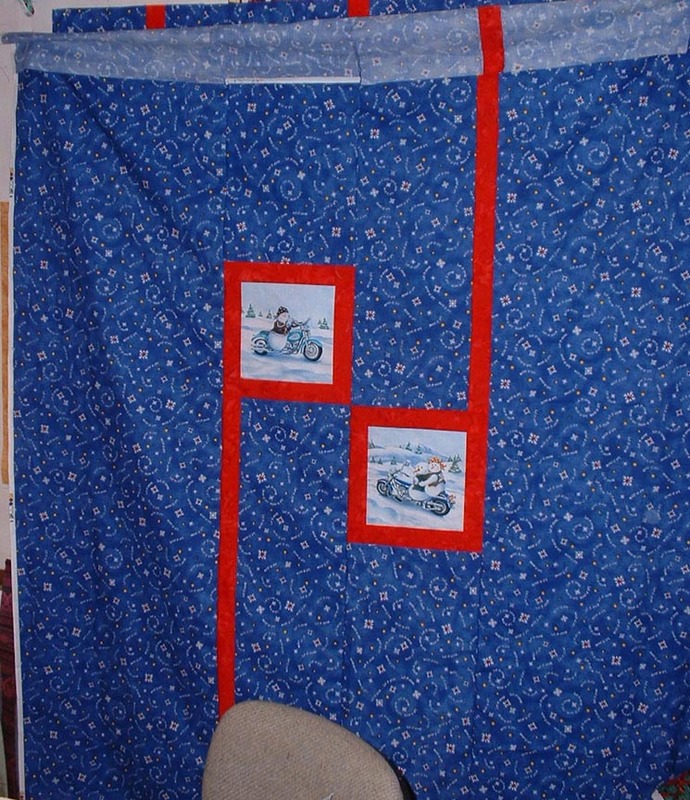 I place the quilt top on my design wall then begin to place the backing on top remembering to leavie enough for a longarm quilter. I too have made mistakes and here is my most recent one. I had two extras fabric squares left over so I attached a border around each one (they are NEVER printed square) to sew into the backing. But on the background piece that is below and above the block, I was short over an inch!! So I just insert a long red strip that is going down on the left block and going up on the right block. Thank goodness that problem was resolved. It probably looks a little bit more interesting than what I had originally planned. So don't EVER feel like you are the ONLY one making mistakes !!! Hang in there!!! Hopefully there will always be an easy fix for any error. I fold the top in half vertically and measure on a tape that is taped to a table. If it is 48" X 2 = 96in add extra 6inches so the vertical measurement is 102"
After I have found the measurements I will be sure that the backing measures the 102" x 86"
I always measure to an affixed tape. I worked at a quilt store and that is how we would figure out the amount of fabric to buy. Jan thank you for your graphics. Love the tech era we live in. Maniac: Love your fix. So much more interesting than it would have been without the "mistake". This is highly untechnical but I just measure the widest width and length than add and an extra 6 to 8 inches. Remember anything that is left over goes in the scrap heap and is not really wasted. There is a free craftsy class called "Creative Quilt Backs" with Elizabeth Hartman. She does a VERY mathematical and graphical method for calculating quilt backs. She also shows some neat backs using pieced fabrics, etc. Worth taking the time to watch, just for the assistance in planning your back. Jan in VA, as always, I so appreciate your graphic pictures. It's just so much easier to understand a concept when it's drawn out. Puttergeo, Check out some of the backs that Bonnie Hunter of Quiltville purposely puts on her quilts. Pieced, pieced, pieced. One would never be able to detect a "mistake". Jan in Va - Thank you for the graphics. I save all your helpful posts. A friend who sewed professionally taught me to work out how much extra I need across the quilt and cut twice that much extra on the length. Then cut that in two across the width, join the short sides then turn sideways and attach to the side. I've done this a couple of times and it does work. I posted a tutorial a while back when I had the same problem. What I did was to lay the backing exactly diagnonal, which leaves some large triangles where it overlaps the front of the quilt. Cut off those triangles from the backing and move them to the places where the quilt doesn't have backing over it. I'd post a photo, but unfortunately I'm at work! I prefer to make my backs in the "style" of the top left and the three on the bottom because they look like they have been 'planned' and not "ooopsie - I ran out of fabric and just sewed on some more to make the back big enough". There have been times when I've received donation quilts to quilt, that I've actually taken the backs apart to make them look "planned" instead of "oopsie". Donation quilts should look great too! MANIACQUILTER - that's an awesome back! That's the kind of back that will gather an 'wow' when people see it. NEVER mention to the recipient the error that got you to the awesome back! Hahahaha! Let them think you 'planned' it that way! You talented girl you! I do the "mathematical and graphical method for calculating quilt backs"....no sense in tossing around extra fabric or tops if I don't have to. No getting on the floor here. I will be making two creative backs this week and will post pictures....if I remember! Hahahaha! Last edited by quiltinghere; 06-10-2013 at 04:00 AM. I usually make piece backs with some sort of design on the back. I've used stripes of the fabrics from the front, and running brickwork from scraps from the top. Recently, I even used a top that was intended to be the quilt top for the back. I'd purchased a kit of Easy Breezy from a garage sale, and made it up, then felt it was just too plain, so I made a Yellow Brick Road for the front, and used Easy Breezy for the back. They were nearly the perfect sizes, and the fabrics coordinated. Here is a link to a photo of Easy Breezy. Basically you take a width of fabric, and edge it with piano key strips of coordinating fabrics in various widths. Very fun, and comes together quickly. It's also important to measure the usable width of the backing fabric before one starts to cut it. Like ManiacQuilter2, I had a method to my madness. On the back of my mom's lap robe I wanted to include some beautiful fall fabric and didn't have enough...............DARN. So I cut the fabric in fourths and put those in the four corners and filled in with other fabrics, putting the label in the middle. She liked the back as well as the front! I checked this site and it said I needed 20.45 ys of backing WHAT!!!! Then I noticed it said for diaginal backing. I know that I can back a 75x90" quilt with 6yds of 45" fabric. sew 3yds together lengthwise making backing peice 85 x 108. Now I ask the sales person to cut 3 yd peices. I may also check into the 108" backing since it really does seem cheaper! I am not really picky about my backing colors.